American Idol Season 10 winner Scotty McCreery has had quite a ride since winning the hit FOX show, and it's not stopping anytime soon. He's getting ready to release his new album, and he's playing a special pre-game concert before Friday's Braves game! Plus, Scotty has big news about how he's giving back to local youth sports programs right here in Atlanta. Scotty paid us an extra special visit on Friday's Good Day to tell us all about it! CLICK ON THE VIDEO ABOVE TO WATCH SCOTTY'S INTERVIEW! CLICK HERE TO SEE PHOTOS FROM SCOTTY'S VISIT TO GOOD DAY! Season Ten American Idol winner and Platinum-selling country artist Scotty McCreery will close out his six-city Major League ballpark tour at Turner Field on Friday, Sept. 27. In a free post-game set, fans will have the first opportunity to see and hear McCreery perform new music off his upcoming Oct. 15 album release, See You Tonight. Prior to performing, McCreery will donate $5,000 to the Braves' local Reviving Baseball in Inner Cities (RBI) program during a special on-field presentation. The Junior Braves/RBI Youth Baseball League presented by Delta Air Lines offers youth ages 5-18 the opportunity to play baseball. Teams are formed in under-served neighborhoods where recreation programs are most needed. McCreery will also lead the pregame Chop Rally in Fan Plaza as well as sing "Take Me Out to the Ballgame" during the seventh inning stretch. After winning Season Ten of American Idol, Scotty quickly established himself as one of the hottest new stars in country music. His debut album was the best-selling solo album released by a country artist in 2011. He became the youngest man in history to have his first album debut atop the all-genre Billboard Top 200 albums chart. That album was certified platinum for sales of one million, and the first two singles from that album were both certified gold. In 2012, his 2012 Christmas album was certified gold. In the last two years, McCreery has performed before President Barack Obama, sung the national anthem at the World Series and performed in the Macy's Day Parade. He was named Top New Artist by Billboard and won best new artist awards at the Academy of Country Music Awards, the American Country Awards and the CMT Awards. To purchase tickets for the game and free admission to the post-game concert, please visit braves.com/tickets, the Braves Ticket Office at Turner Field, the Braves Clubhouse Store at the CNN Center, all Ticketmaster outlets, or by calling 1-800-745-3000. 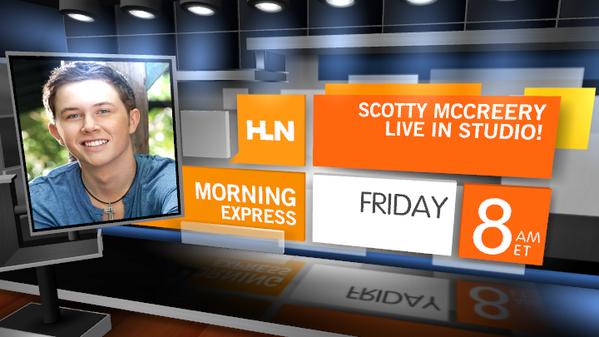 @ScottyMcCreery will also be @HLN @MorningExp this Fri morning 9/27! Who's coming?